1. How can I search for products? In the web-shop, you will find a ‘Search’ functionality in the upper middle of the Webshop you can enter a search term to search within our product range. 2. How can I order products? You can order a product by clicking “Add to cart”. The item will then be placed in your shopping cart. You can continue shopping by clicking the ‘Continue Shopping’ button or you can proceed to the checkout page. You can do this by clicking ‘Proceed to Checkout’. 3. How do I know which items are in my shopping cart? In the upper right-hand section of the screen, you will find an overview of the number of products in your shopping cart, “In the upper right-hand section of the screen, you will find the number of products in your shopping cart. By hovering over the number, you can see the details, including price and quantity. By clicking ‘Checkout’, you can proceed directly to the checkout page. By clicking ‘Checkout’, you will proceed directly to the checkout page. 4. I want to make a change to my shopping cart. How can I do that? If you wish, you can make changes to your shopping cart. You can remove a product from your shopping cart by clicking the x in front of the product image. The product will be removed from your shopping cart. You can change the quantity of a product in the ‘QTY’ column. Clicking ‘Update Shopping Cart’, will update the subtotal. 5. How do I know if my order has been received? When you place an online order and include your e-mail address, you will receive a confirmation via e-mail. This confirmation includes an overview of your order. 6. Can someone else place an order in my name? Within the web-shop, we make every effort to prevent improper use of information. The payment methods provided and the registration module minimise the risk of improper use of information. If you experience any problems, please call or e-mail us directly. Together, we will find a solution. 7a. Up to when can I place an order? Graphics can be ordered up to 2 weeks before the event. Additional stand construction materials can be ordered up to 1 week before the first day of set-up. Furniture can be ordered up to 2 days before the opening of the exhibition. We will try to deliver last minute orders, we do this in consultation with our suppliers. 7b. What about late orders? It is possible to place a late order during the exhibition or during the set-up of the stand. Late orders will be discussed with our suppliers if it’s possible to have these delivered in time. We will do our utmost to arrange it for you. 8. Can I alter rented materials? Altering stand materials, for example by drilling or hammering, is prohibited. Adhesive tape may be used, but must be removed at the end of the exhibition by you without damaging the materials Any damage caused will be charged. 9. Am I allowed to use a drill or hammer on the walls? No, you may not use a drill or hammer on the walls. See the answer on question number 8. 10. What are the standard wall dimensions used? This differs per project. Under ‘Downloads’, you can find a technical drawing with specifications. 11. What color are the walls? Normally we use white walls. Under ‘Downloads’, you can find a technical drawing with all specifications. 12. How many spots are included in my stand? This differs per project. You can download specific information or find it in the information supplied by the exhibition organization at the time of application. 13. Is electricity (power supply and consumption) included in my stand or do I have to request this? 14. How do I request electricity for my stand? More specific information can be found on the exhibition’s webpage or in the information supplied by the exhibition organization. 15. How high is the fascia? 16. How can I submit text for the fascia? 17. Where can I order logos, banners, etc. 18. What if a product is no longer in stock? In this case, we will contact you as soon as possible and together we can decide on an alternative. 19. When will the orders be delivered? 20. Can I change an order? 22. When will I receive the invoice? After payment with a credit card and completion of your order, an invoice and order confirmation will be sent to the e-mail address provided. 23. When must the invoice be paid? The payment should be paid directly by credit card after you clicked to the ‘Proceed to Checkout’ button. You will be forwarded to the checkout page, select a payment method iDEAL (only Dutch Banks) or creditcard and debit card. Select a creditcard or debit card and click on the ‘Place Order’ button. You will be redirected to the payment provider Buckaroo. On request it is possible to pay by bank transfer, an additional cost of € 45,00. Bank transfer payments must be made within two weeks, otherwise the order expires. You can pay by Credit Card. On request it is possible to make a bank transfer payment, an additional cost of €45,-will be charged instead of €15,-. 24. What payment options you offer? There are three payment options in the web-shop: via iDEAL(only for Dutch bank-accounts), via credit card or via advance payment. iDeal allows you to make online purchases in a familiar, secure and simple way. iDEAL is a system that links your online purchase directly to your online banking environment. To use iDEAL, you don’t need to register, download files or create an account. If you already have online banking with ABN AMRO, Fortis, Postbank, Rabobank or SNS Bank, you can make payments using iDEAL right away. The transaction is completed swiftly and simply in the familiar banking environment of your own bank. 26. How long does it take for my payment to be processed? 27. Our company is located abroad. How does that work with VAT? If you rent materials, we will not charge VAT on the invoice. If you are located within the EU, we will need a valid VAT number. This is not the case if you are located outside of the EU. In case of the sale of materials, the application of VAT depends on the exact situation. 28. We cancelled our order, how long does it take before I get my money back? 29. We ordered Graphics, where can I send my Artwork? 30. What seize and specifics do I have to send regarding my ordered graphics? 31. I have a Question, where can I ask my Qestion? 32. I have a complaint! We are sorry that you are not satisfied, we want to apologise at front. 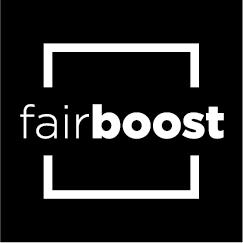 Please send your complaint to webshop@fairboost.nl We acknowledge receipt within 48 hours. The alteration of rented materials is prohibited. If rented products are severely damaged or missing, charges will be made based on the value when new.